The Boston Architectural College is pleased to announce that the College has received a 2013 Boston Preservation Alliance (BPA) Achievement Award for its 951 Boylston Street renovation project. 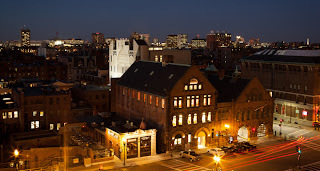 Bestowed annually since 1988, the Preservation Achievement Awards honor outstanding achievements in historic preservation and compatible new construction in Boston. Celebrated for their positive impact on the city's built environment, winning projects are looked upon as models for future preservation work. To read more about this honor, click here.